Vampire Bats Video Slot Guide & Review - Casino Answers! Vampire Bats is a 5-reel, 25-line video slot developed by Cryptologic, featuring a wild substitute symbol, scatter wins, a re-spin feature and two progressive jackpots. You can play the Vampire Bats video slot at [Americans: Unfortunately due to legal restrictions you are unable to play at any of the online casinos this game is at. We recommend you trying playing the unique slots at Win A Day Casino instead.]. Bets on the Vampire Bats slot machine are $0.01, $0.02, $0.03, $0.04, $0.05, $0.10, $0.15, $0.20, $0.25, $0.50, $0.75, $1, $2, $3, $4 and $5 per line. 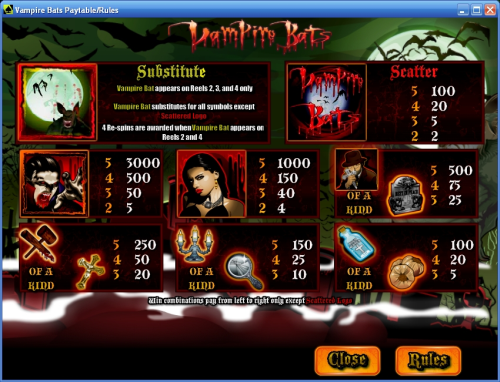 You can select 1-25 paylines on a spin on the Vampire Bats online slot. You can bet anywhere from a penny per spin on Vampire Bats up to the highest total bet of $125 per spin. Vampire Bats has a wide enough betting range for all types of slots players, from low stakes to high stakes players. To play the Vampire Bats slot with all 25 lines, hit the “Bet Max” button. For all other bets, press the “Spin” button. 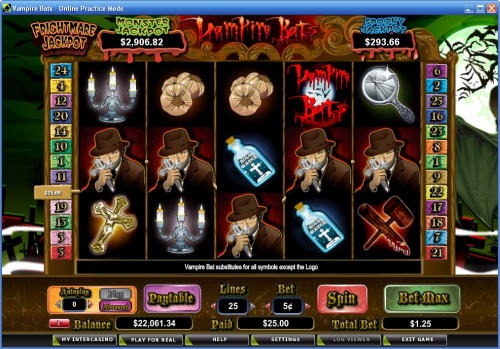 The highest paying symbol on the Vampire Bats video slot is the Vampire symbol. If you hit 5 Vampire symbols on a selected payline, you will win the 3000 coin top fixed jackpot. The second highest paying symbol is the Victim at 1000 coins. To play for these payouts, head over to [Americans: Unfortunately due to legal restrictions you are unable to play at any of the online casinos this game is at. We recommend you trying playing the unique slots at Win A Day Casino instead.]. The Logo is the scatter symbol on Vampire Bats. 2, 3, 4 or 5 Scattered Logo symbols will pay out 2X, 5X, 20X or 100X your total bet. Scatter wins are multiplied by the total bet and added to payline wins. The Vampire Bat symbol is the wild symbol on the Vampire Bats slot game. It only appears on reels 2, 3 and 4 and substitutes for all symbols except for the Scattered Logo. When the Vampire Bat symbol appears on reels 2 and 4 at the same time, you will win 4 re-spins. All positions on reels 2 and 4 will substitute for all symbols except for the Scattered Logo symbol Re-spin payouts are based on the original lines and bet of the triggering spin. Vampire Bats is linked to two progressive jackpots called the Frightmare Jackpots. There is the Spooky Jackpot, which at the time of this writing is at $475 and the larger Monster Jackpot, which is at $4,600. The Frightmare Jackpots are won at random, although the size of your wager will increase your odds of winning the jackpots. Vampire Bats has an autoplay mode that allows you to play up to 999 spins. You can set stop settings by hitting the “Advanced” button. You can set the autoplay mode to stop after a cumulative win of up to $5000, a cumulative loss of up to $5000 or after a single win of up to $5000. You can stop the Vampire Bats autoplay mode at any time by hitting the “Stop” button. Vampire Bats’ highlights include the re-spins feature and the progressive jackpots. Besides that, there is no bonus game and the payouts are decent at best. Regardless, if you’re a fan of vampires, you may want to have a taste of the Vampire Bats video slot at [Americans: Unfortunately due to legal restrictions you are unable to play at any of the online casinos this game is at. We recommend you trying playing the unique slots at Win A Day Casino instead.]. Can I play a free Flash game of the Vampire Bats online slot? You can play Vampire Bats in Instant Play mode in your browser at [Americans: Unfortunately due to legal restrictions you are unable to play at any of the online casinos this game is at. We recommend you trying playing the unique slots at Win A Day Casino instead.]. You can play for real money only. Practice mode is not available. If you experience any difficulties with the Flash software, make sure you have the latest version of Adobe Flash Player installed. What are the other Frightmare Jackpot slots? Other Cryptologic video slots that are linked to the Frightmare Jackpots are Zone of the Zombies and Witches and Warlocks. You can play both of these games along with Vampire Bats at [Americans: Unfortunately due to legal restrictions you are unable to play at any of the online casinos this game is at. We recommend you trying playing the unique slots at Win A Day Casino instead.]. How do I win the progressive jackpots on the Vampire Bats slot game? The Frightmare Jackpots are triggered at random. To increase your chances of winning either the Spooky Jackpot or the Monster Jackpot, you can increase your wager. If I’m in the United States, can I play the Vampire Bats slot for real money? Unfortunately, American players cannot play at Cryptologic casinos for real money. For an alternative, please check out our Vampire Vixen Video Slot Review and Mystic Slots Review.